There is more than one artist under the name Heaven & Earth. One is a soul group from Chicago, Illinois, U.S.A. and released 4 LPs from 1976 to 1981. >> A vocal quartet that originally went by the name the Soul Majestics, and consisted of brothers Dwight Dukes (falsetto/lead tenor) and James Dukes (bass), Keith Steward (tenor) and Michael Brown (baritone). Under the direction of producer Clarence Johnson, they recorded four albums as Heaven Earth: one for General Entertainment Corporation (GEC), three for Mercury (Phonogram) and one for WMOT. One is a soul group from Chicago, Illinois, U.S.A. and released 4 LPs from 1976 to 1981. A vocal quartet that originally went by the name the Soul Majestics, and consisted of brothers Dwight Dukes (falsetto/lead tenor) and James Dukes (bass), Keith Steward (tenor) and Michael Brown (baritone). Under the direction of producer Clarence Johnson, they recorded four albums as Heaven Earth: one for General Entertainment Corporation (GEC), three for Mercury (Phonogram) and one for WMOT. Brown recorded on the first album and subsequently departed the group in 1978 and was replaced by Dean Williams. Williams recorded on the second album, and he too then departed, being replaced by Greg Rose. The group could not manage to retain a compatible fourth member, whose vocal input was essential considering he was the baritone. In 1982, Dwight Dukes departed the group and formed the trio Cashmere with McKinley Horton and Daryl Burgee, recording on Philly World Records. Later that year Steward joined the group, and shortly thereafter Heaven Earth disbanded. Even though the Chicago-based quartet didn't shake up the charts with their releases, their recordings were absolute quality. In particular, the tracks written and produced by the songwriting/production team of Rodney G. Massey and Lawrence Hanks. 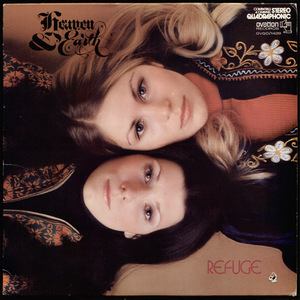 Heaven Earth is a must listen for vintage RB lovers.